I thought it would take just a couple of days to get the path finished once I had done the initial tricky part of going round the corner… but here we still are and still a long way to go. I finished off on Sunday with a small section after the corner which turned out to be more tricky than I thought. 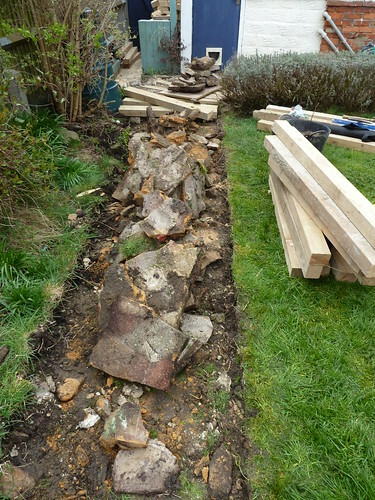 I had decided that I would be pulling up the paving slabs and putting the wood down on the concrete under the slabs but this would had meant the path benig a lot higher than the lawn which would then not keep the stones in too well. I really did not want to try to dig up the concrete underneath as I thought it would be pretty thick and also take ages to get rid of. As it happens, I had little choice as I made my first hits with the pick axe to break off bits of stuck concrete and accidently went through it. It turned out not to be thick after all and in fact took just minutes to pull up the whole path. Two trips to the dump later and it was all cleared. The next tricky part was to make the path slop downwards from the corner to the now lower part by the lawn, plus to dig into the bank in order to move the path over slightly. All this digging, levelling, slopping, and still going round a slight corner still meant progress was slow. But now we are round corners, sorted out slops…. all that is needed is to remain going in a straight line with the only obsticle being having to dig into the bank. Meanwhile, another load of pebbles got delivered and I’ve told our Freecycle friend that we probably have more an enough now. 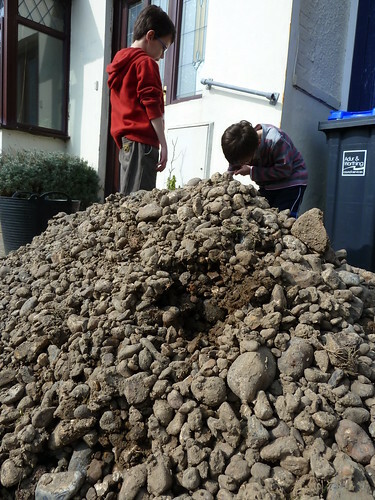 T&J are sorted some into piles of larger pebbles which we can use for the top layer. The rest is being washed and then dumped inbetween the gaps. 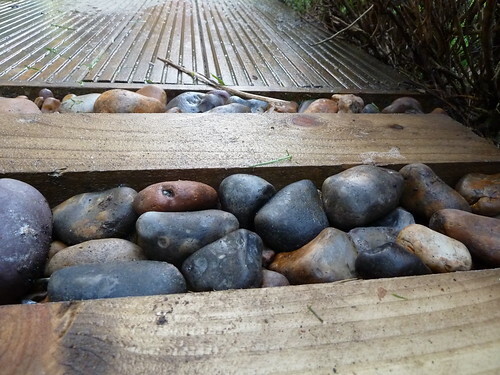 A long and wet process, I think to get the top layers covers in the large cleaned pebbles may take some time. I know spring does not start until the 20th March, but we can forgive a day or two…. 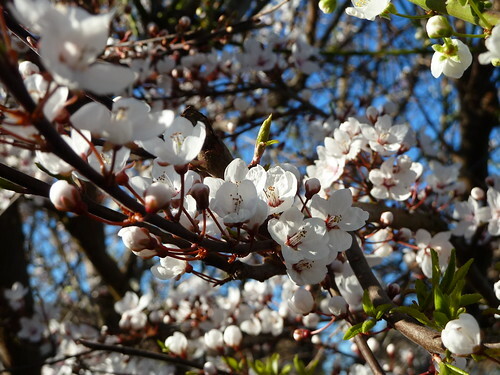 The blossom on the trees started to appear earlier this week and now it is certainly here, small and perfect flowers appearing more and more. Today it has been cold in the shade but warm in the sun under the blue cloudless day. 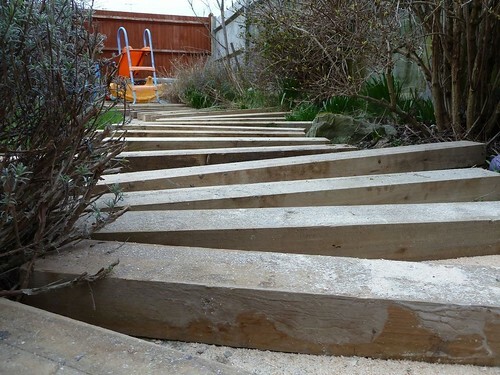 With the waste wood off Freecycle we started laying the new wooden path. Taking up the paving I found an older concrete path underneath but fortunately everything is at the right height to base everyone off that. I chipped the loose bits off and started cutting and placing the wood in place. This initial bit goes round a sharp 90 degree corner which needed a bit of planning and with a lot of experimenting all day on different ways to do things I have not gone far but I have made a start. The bloke with the pebbles (off Freecycle too) turned up with a trailer full of pebbles. Probably slightly smaller than I wanted but good all the same. If we need to then we can get some larger pebbles for the top, but we shall see. They are rather muddy at the moment but nothing rain or child labor will be able to deal with. The funny part to all this is that the pebbles come from another person’s garden which backs onto the beach, all that seperates the pebbles in their garden and the ones from the beach is a small brick wall. They dare not dump their pebbles onto the beach, it’s against the law, and so they put them onto Freecycle, I answered, and now they will be in our garden. Much the same way that in theory I could go over to the beach with a bucket and pinch pebbles from there, but no pebbles go on or off the beach – that’s the law. The plan tomorrow then is to set the bits of wood I have cut to size into some dry cement and sand, probably mixed with small broken up bits of concrete that I have dug up too. Water them and wait for them to set. After that we can start to put the pebbles inbetween and so help judge how many more we might need. I may possibly get round to laying the rest of the path, we shall see how it goes. I plan to make a start on this over the weekend. The other week we managed to pick up some free wood off freecycle for burning on the fire. When the bloke stopped by to drop it off it turned out to be a whole transit van full of thick good quality wood that would take months for us to get through on the fire. 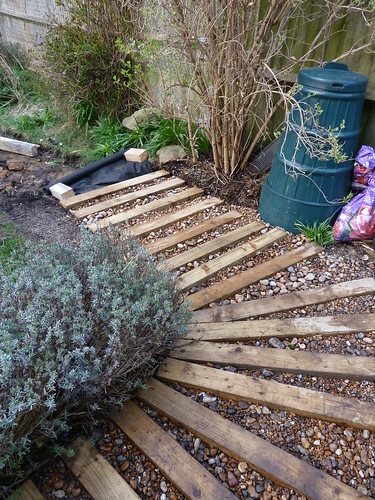 One the the things i have wanted to do in the back garden for a while is to get rid of the boring and strict path that goes up to the similar paved patio area. The idea here has been to replace the straight line with something more wriggly and organic, at the same time moving the path nearer to the fence and so giving us a bit more grass and sorting out the small script between the path and the fence which really is a bit of a waste. It was originally put to grass for the rabbit to have a large run along the side, but the day after doing this the rabbit escaped and got eaten by a fox. Apart from the obvious sadness of finding bits of rabbit all over the garden, it was a bit annoying to have spent all that time sorting out a home for the rabbit. 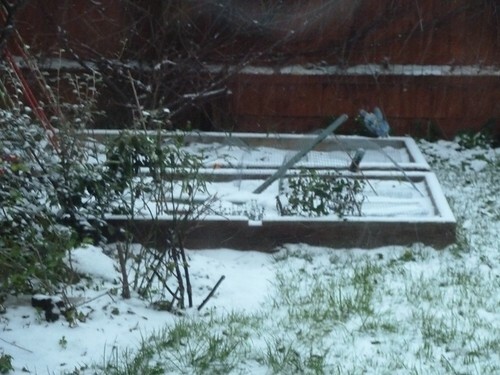 To add some history to this, for the last 12 months the rabbit had been free range within the garden and so it was just bad luck fir the rabbit that the one time he needed to be safe from foxes he managed to get himself into a bit of trouble. 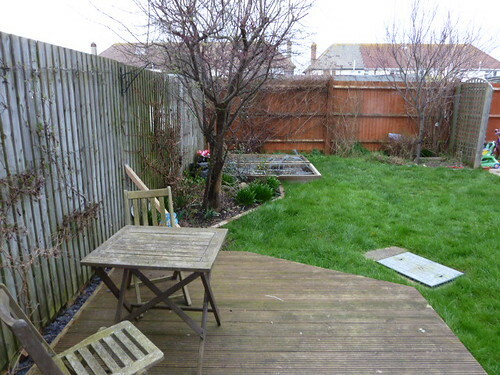 That explains why we have a bit if unused grassy bit of garden which is too narrow for anything and a bit of a mess as it is too small to mow too. 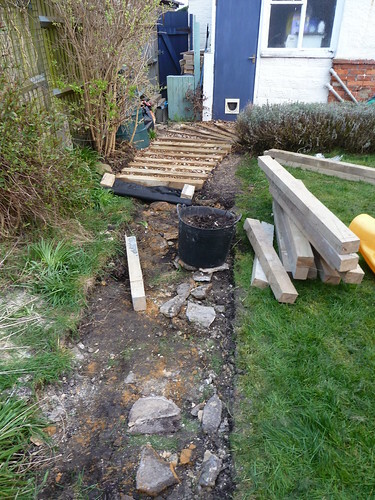 The plan then is to dig up the paving slabs and anything underneath and then cut the wood to size to make an even width wiggly path. In between the wood will be pebbles which gives a further organic feel to it and is quite fitting seeing as we are right next to. A pebbled beach. I did have plans to sneak over to the beach in the middle of the night and get the pebbles that way. I dismissed this when I thought just how many trips I would have to make to the beach and how heavy pebbles are, and that it is not really legal to remove so many from the beach. Then, as if by magic, along came an email from free cycle from a person getting rid of pebbles from their garden! An exchange of emails took place and it turned out that this bloke had a garden full of pebbles and was replacing it with grass and would have trailer loads of them. So free wood and free pebbles. The email exchange then went cold and so I’m hoping it is still on and that by the end of the week I will be the owner of a big pile of pebbles. Lots of promise for 2011 but yet any to be lived out. So far work in the garden has been little to nearly reaching none at all. The Square Foot Garden beds have not been touched since last year and remain to be mainly used as a cat toilet (part of the reason why they are yet to be touched). Before I do anything I need to made up some frames in order to stop the cat getting onto them, and I must do that fast otherwise time will have run out before I get to do anything. The beds need tidying up, cat poo removed and new compost added on top. I wonder if last year they got too water logged which is why we had limited success, maybe the mixture of peat and vermiculite was too much for it. It seemed very dry on top but moist and warm when you put your finger in it, if it had been sunny for a number of days. But as soon as it rained, certainly near the end of the growing year, it remained very wet. My plan then is to top up with compost only. The decking needs a good clean. not helped by the leaking toilet overflow which has been dripping onto the decking for nearly a year now. 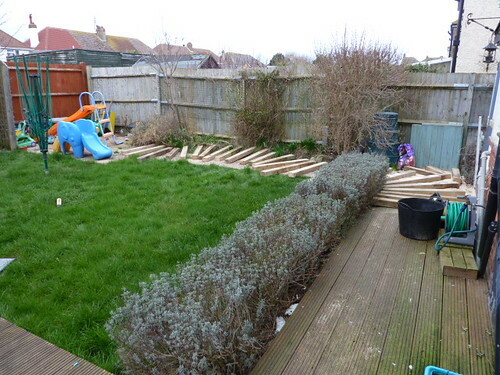 It’s on my list to fix, it really is, but for now it means a rather green and wet section of decking. You may spot the wood down one side of the garden, there is a story behind that….. Our new open fireplace is going well and over winter I had managed to pick up some free wood which I cut up and we used. This was coming to an end when another source suggested they had some waste wood from building sites that if I wanted they would leave on the driveway. Bingo, I thought. The large Ford Transit arrived early one Saturday morning and they unloaded and kept unloading. 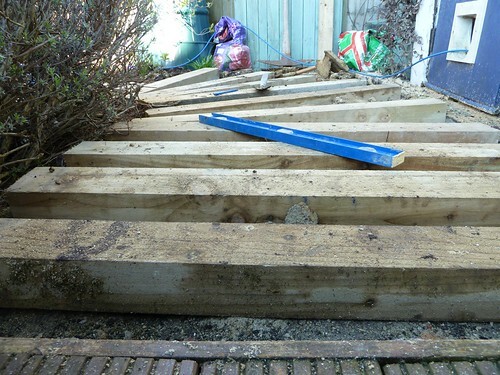 The van was completly full of wood that had been used with concreting, big thick long lengths, all on our driveway. The bloke told me he would leave it a month or two before he comes next as it would take some time to burn it all. A slight understatement, I think we have wood here for 6 months or so! For the past two or three weekends I have been slowly cutting up the wood and we have done very well for free wood, free heating in the evenings. The wood is good stuff though, big thick bits of it. What you see in the photos here then is just a small amount of it (the rest is already cut up and round the side), and trying out various garden project ideas before the rest is either put to good garden use or cut up too for burning. Watch this space…. Not a lot going in here, infact the winter had seen the beds being used as a cat toilet which has not pleased me at all. Attempts to stop this and to stop the cat digging up the winter onions has not really worked and we are now quite a lot down on onions that might make it through the winter. A serious rethink is needed then, a way to cover the beds over that does not get in the way. Unfortunately any method of covering over will get in the way, but I really need to stop the cat. Fortunately, the snow is stopping the cat from going outside at the moment, and so it is safe. It has been very wet and damp these last weeks and now the sun is much lower during the day the garden does not get that much sun. This means things will now be wet until the spring time and so I wonder how much more we will get out of the square foot garden until that time. This weekend it has been different and not only sunny but hot too. The garden is still soaked but I really did have to cut the grass before the lawn turned into a some wild forest. Quite a challenge as the lawn mower no longer has any blades attached to it. It is a cheap flymo rip off that we bought from B&Q a number of years ago for £10 or something silly and we have kept it outside ever since. Probably not the recommended way to look after electric equipment and “don’t do this at home kids”. As part of this the plastic blades get brittle from being outside and break all the time and currently we have not bought any more. Amazingly, it does still cut grass even if it does no longer hover over the lawn. On the wet long grass it was quite a job then to get it all cut, but cut it now is and all raked up. 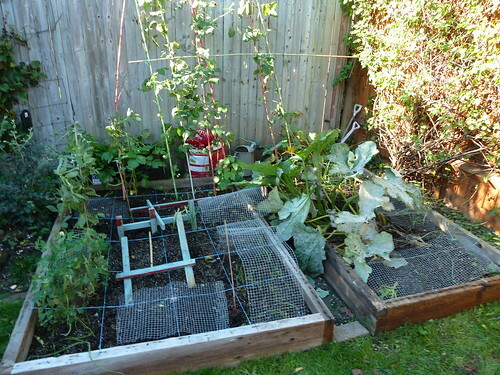 The square foot garden was in a bit of a sorry state and so today was chance to tidy it up a bit. That cat is digging up as much as he can at the moment which was the end to some of our turnips the other week. 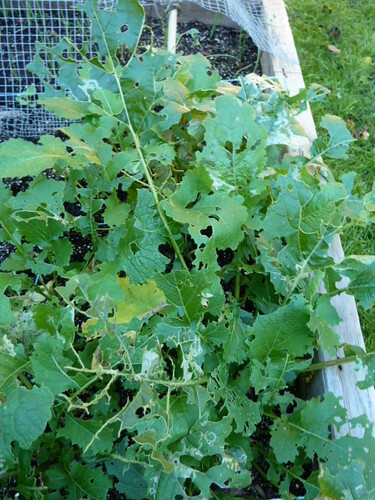 The turnips on the whole have not been a success. Firstly the caterpillars stripped the leaves as quick as they could which was the end to many, while the others never really developed into much. They all had roots but not as a turnip shape ball that you would want to eat, infact just the one was anything that looked like a turnip. We did something a bit wrong here, off to look up what happened in my veg book. The sweetcorn I was not too surprised with our lack of result as they were planted very late. Next year we will be much more organised and do it on time, I am thinking it this spot was still getting a lot of sun then we would have at least tiny baby corns. As it is, we did have tiny baby corns but they were being eating by various insects and everything was extremely wet. 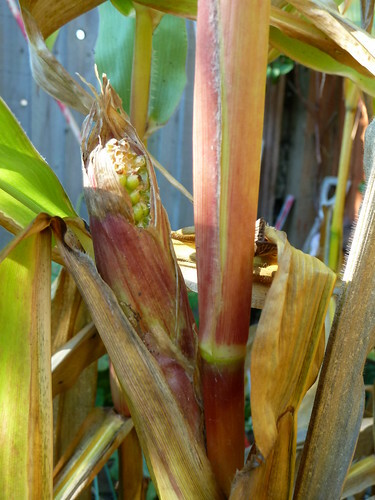 This was the first time ever for growing sweetcorn and we did not know what to expect at all, at least next year we will know a bit more and might even get to eat some of it ourselves. 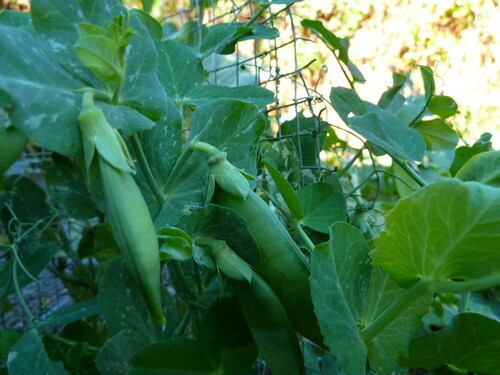 Not everything is bad though, our late peas have flowers and are podding and doing quite nice. There probably won’t be a huge number of peas as we only did one square. At this time of year it is clear now that these late plants could go in the majority of the free squares in order to get a good overall harvest especially peas which can be frozen once picked. Doing well too are the late broad beans, despite the wind trying its best to keep knocking them down. 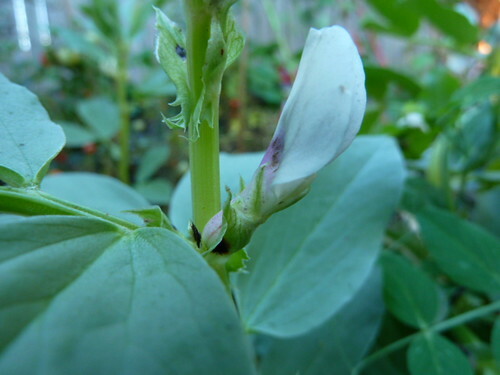 All broad bean plants are full of flowers and with hope might get to producing beans before the frosts come, these last couple of hot days will be a great help. 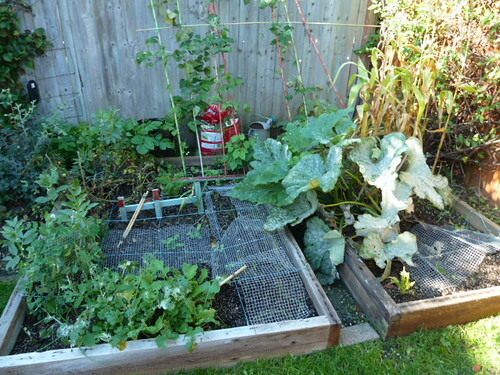 The massive courgette plant is taking over the square feet, lots of leave but little else. Courgettes come and go, mostly eaten by something or rotting before they get too big, probably too wet. Keeping an eye on things each day and picking baby courgettes before this happens has given us a small harvest but nothing like last year when we had so many we ended up using courgettes in chocolate cake! Winter onions are still there, some got dug up by the cat but the majority are hangining on. We’ve never grown over wintering onions before and so I will be interested to see how they all cope with the winter and hope to have a good harvest.